D E S I G N L O V E F E S T » MY FAVORITE HIP HOTELS! 1. hotel st. cecelia – i gotta say, this was one of my most memorable hotel experiences. we stayed in one of the bungalows and every last detail was fantastic. it felt like you were sleeping in a luxury treehouse with a living room complete with a velvet couch. the beds were heavenly. the pool had this big neon sign (see here) and even the room keys were rad. plus, you could walk to south congress for tons of restaurants and bars. 2. the wythe hotel – i am writing this post from that bed up there. holy cow this room is special. we asked for the corner room (always ASK at places because a lot of the times they have it available and can switch you into it for free) and the views are spectacular. the walls are brick, the ceiling is wood, and the bathroom is white subway tile. classy stuff. the rooftop bar is stunning. the whole place just has a very cool vibe. it’s not the most “warm and cozy” place…but that’s alright with me. 3. the cullen – we stayed here for over a week and felt so at home. the room was actually split in two so angela and i both had beds separated by a divider which made it feel like we had our own rooms. i still remember not ever wanting to get out of that bed. they had amazing packaging on their soaps (i may have taken a couple as a souvenir) a wonderful staff, and rooms full of quirk (like this donkey on the glass.) the hotel restaurant was also quite good! 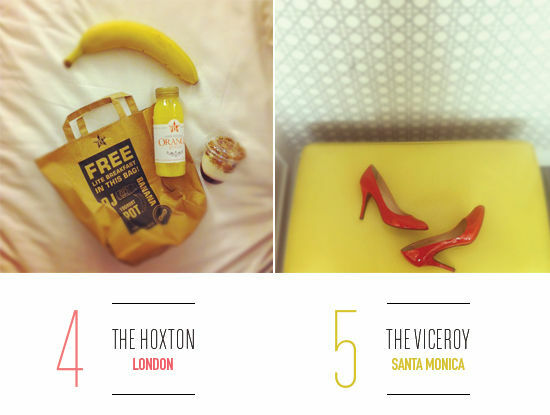 4. the hoxton – this hotel is actually really affordable for what you get. it’s a great location in shoreditch, happening vibe, and modern design. you get this adorable breakfast shown above delivered to your doorstep every morning (little things like that sure make you remember a place, huh?) we are headed back to teach in london next month and already booked our room again. also, it’s sure nice when you walk into a hotel and can connect to fast wifi with no password or charges. they do things right here. also, the ace hotel is always a good choice if you want stylish and not a million dollars, we have heard great things about the jane hotel in new york and are going to try it out when we go back to teach in may. we are headed to spain & paris next month for vacation and i booked these two apartments (here and here) to switch it up this time. i’m crossing my fingers that they are as great as the photos & reviews! i really love sharing my hotel experiences either on the blog or over on instagram, hopefully you enjoy following along and making notes about your future travel plans! Oh man, what a rich girl post! That’s not to say you haven’t earned your point of view – it’s evident that you’ve worked, and are working, very hard to get where you are… but still… this post reeks of privelege. My husband and I love to travel, mostly road trips (3 times from east to west coast! and many other trips). Our lodging usually involves pitching a tent out under some stars and vowing only to eat at local restaurants and coffee shops in each town we visit. We love this. We would also probably love to stay in these fancy hotels, but however hard we work (and we work hard), I don’t see us affording trips like these anytime soon without putting ourselves in debt (which we don’t dig). I love reading this blog, and others like it. But sometimes I feel I can’t connect or identify with the lifestyles being represented in blogs such as yours. I am a creative, and I’m a damn hard worker – that is some common ground I can stand on – but every now and then I realize that while the bloggers I follow often make several trips in a year to trendy hotels and foreign shores, I will have to save for over a year, sacrificing things like brunch and pretty dresses, to take my very first trip out of the country… and when we get there, we’ll probably camp. Am I alone in this, readers? If so, it’s cool. I’m not mad… in fact I’ll probably feel lame about posting this in a few days when I’m no longer PMSing. Def keeping this post for reference! I’m with you, hotels are so fun! It’s all in the details. I’ve always wanted to stay at the Wythe, I’ve heard such great things about his hotel! There is nothing better than a fab hotel, esp when you’re working. (So many end up blending together). I used to travel to Sydney to work every month for years, and getting a great place to stay became a must. You can’t work and be uncomfortabl! On your shores, one of the coolest looking hotels I stayed in was The Pelican in Miami. All the rooms were themed. Oh, and the best small hotel in Mexico city is The Red Tree House. Bri! I booked two nights at the Hoxton for Blogshop London! I have heard great things and always wanted to stay…thought Blogshop would be the perfect opportunity! So I guess I’ll be seeing you around! I am obsessed with unique hotels and love all these great finds! Thanks for sharing! I loved staying at The Jane – the rooms are tiny (we had a bunk bed, cabin room) but there’s still the feeling of being in a boutique hotel with the free robes and slippers. And it’s in a great area! Thanks for sharing these hotels – always great to get travel tips! Thank you so much for these tips, Bri! When I see your images on Instagram, I always wonder where you’re at. That picture of the hotel you’re at in NYC is AMAZING! My husband and I will definitely have to check it out. If you have tips for hotels in Boston or DC, please do share! I’m going to check out that hotel in Brooklyn next time I’m out there. My favorite spot – and I’ve only been there once (for free) is the Honor Mansion in Healdsburg, CA (Sonoma County). Here’s the link: http://www.honormansion.com/honor-mansion-lodging/cottage-suites/garden-suite.html. I’m saving up to go on my birthday next year. I am so excited about the Wythe…hope to stay there soon! Thanks for sharing your favs! Wait a minute… I read your post yesterday and then today, two more bloggers I read talked about how great the Wythe is. Hmmmm. Is that a coincidence? Or is this a “sponsored” post? Semi-sponsored? I guess what I’m wondering is… did you get to stay for free at any of these places? I’m only asking because I used to be a travel writer and so I know all about the ad as editorial stuff. Only, I suspect you would have told us if that were the case. Interesting post, I think I’m going to check out the Hoxton in London. When possible, a good hotel makes all the difference. hi karen! nope, we paid to stay at the wythe 🙂 just loved it and wanted to share! I absolutely love the Ace Hotel – its a fun and quirky hotel that is also really reasonable! I love that all the rooms are different and a photo booth in the lobby surely doesn’t hurt. hi bri! i saw this post the morning of my 3rd & final interview with the viceroy hotel. ive been a HUGEEE fan of you and dlf so i knew it was meant to be when i read your little blurb on the viceroy. long story short…I GOT THE JOB! I just got back from a 10 day trip to London and decided to splurge on one night in a hotel (a nice break from crashing at friends’ places). I also stayed at The Hoxton and love loved it! Breakfast delivery, great location, close to the tube, super friendly staff, just the right amount of hip. Still bummed I didn’t get a go at the photobooth… There is something so magical about checking into a good hotel. Love this post! Heya i’m for the primary time here. I came across this board and I in finding It really helpful & it helped me out much. I’m hoping to provide one thing back and aid others such as you helped me. I’m wondering where you stay when you venture to Seattle – looking to book a weekend getaway, and your hotel recommendations are always fabulous. I experience study load of personal blogs in addition to gone through some,however your work is really impressive.Caps off in your enthusiasm plus truth.Do retain us all enlightened at a later date too. brussels. I’ll bee grateful if you continue this in future. Lots of people will bee benefited from our writing. To get to the free music mp3 on iTunes, you’ll need to open iTunes as well as select iTunes Store on the left-hand side. get a checklist of valuable websites to your inbox weekly. little thing coming from food to household products. been actually the kickstart to many-an-entrepreneur’s community-building attempts. a nearby SIM memory card. life and in my home web sites. Fred Mawer finds nine sites that will assist you aggravate out the capital’s even more one-of-a-kind experiences. in the grow older of the World wide web is that resources can be updated consistently. information, like a telephone numbers or email address.